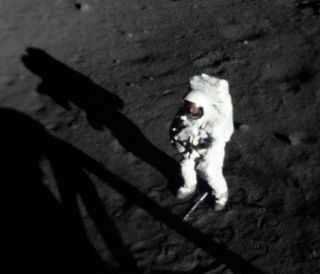 PALO ALTO, Calif. — Neil Armstrong, the first person to set foot on the moon, thinks humanity should stop neglecting the space environment much closer to Earth. The United States dropped most of its test flights in the stratosphere and suborbital space after figuring out how to send humans to low-Earth orbit and the moon, said Armstrong, who stepped onto the lunar surface during NASA's Apollo 11 mission in July 1969. He thinks it's time for that to change. "In the suborbital area, there are a lot of things to be done," Armstrong said here Monday (Feb. 27) during a presentation at the 2012 Next-Generation Suborbital Researchers Conference (NSRC-2012). "This is an area that has been essentially absent for about four decades, since the X-15 finished its job." The test flights of the X-15 and other experimental craft of the era helped pave the way for future vehicles, such as NASA's iconic space shuttle. Further investigation and exploitation of suborbital space — this time led not by the government but by private industry — could provide more technological and economic benefits to the country, Armstrong said. "There's a lot of opportunity," he told a room full of 400 or so people. "So I certainly hope that some of the approaches that you all are providing now will prove to be both profitable and useful." Multiple private spaceflight firms are aiming to take both scientific experiments and paying customers up to suborbital space. Such trips would reach altitudes of about 62 miles (100 km), and return back to the ground without making a complete orbit of the Earth. Suborbital SpaceShipTwo glides over Mojave Air and Space Port in California. These companies include XCOR Aerospace, which is developing a two-seat rocket plane called Lynx, and Virgin Galactic, whose SpaceShipTwo vehicle can seat up to six passengers, along with two pilots. The presence of a spaceflight legend like Armstrong at NSRC-2012 should help shine a light on the promise of commercial suborbital spaceflight, some researchers say. "I think that this shows that commercial suborbital, while being leading-edge, is also becoming mainstream," saidAlan Stern, associate vice president of the nonprofit Southwest Research Institute, which has bought tickets for its scientists and experiments on both the Lynx and SpaceShipTwo. "The fact that he wanted to travel across the country — he actually cancelled an overseas trip so he could speak at a suborbital conference — I think speaks volumes," Stern added.